with P. & D. Colnaghi, London, 1963, no. 34. R.-A. d'Hulst, Jordaens Drawings, London, 1974, no. A36. Related to an early composition of the Incredility of Saint Thomas, now lost, dated by d'Hulst to 1613-15. 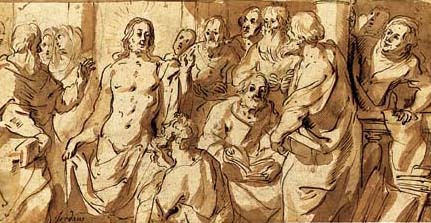 The present drawing, and another of the same composition in a private collection, display the ability of the young Jordaens to play on a theme. The distinctive character of Jordaens' compositions, with half-length figures crowded in the foreground in order to emphasize their facial expressions and the theatricality of their gestures, is already clearly perceptible.